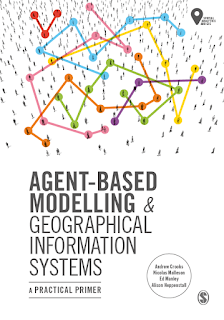 From these two standpoints we have developed a book that provides a practical primer in the integration of agent-based modelling and geographical information systems. 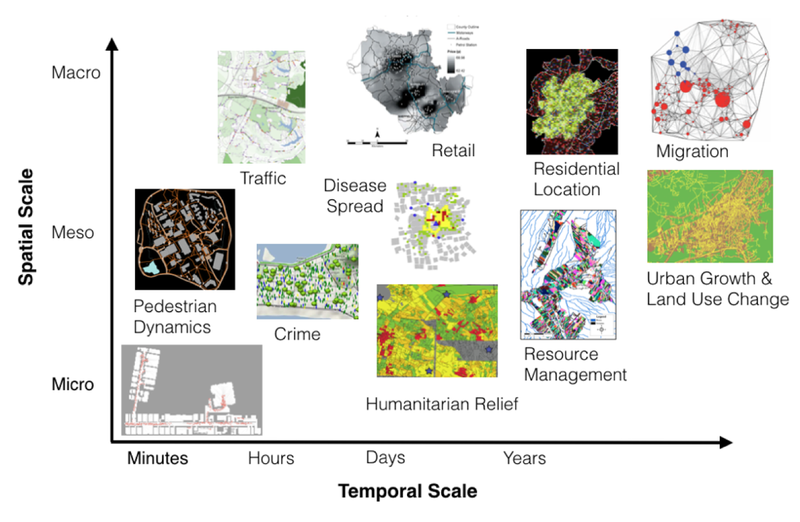 In outlining the subject we cover many examples of geographical phenomena, from linking the individual movements of pedestrians to aggregate patterns of urban growth, to the integration of social networks into modelling mobility. Through this text, we hope the reader will understand how the field has developed, how agent-based models are different from other modelling approaches, and the future challenges we see lying ahead. 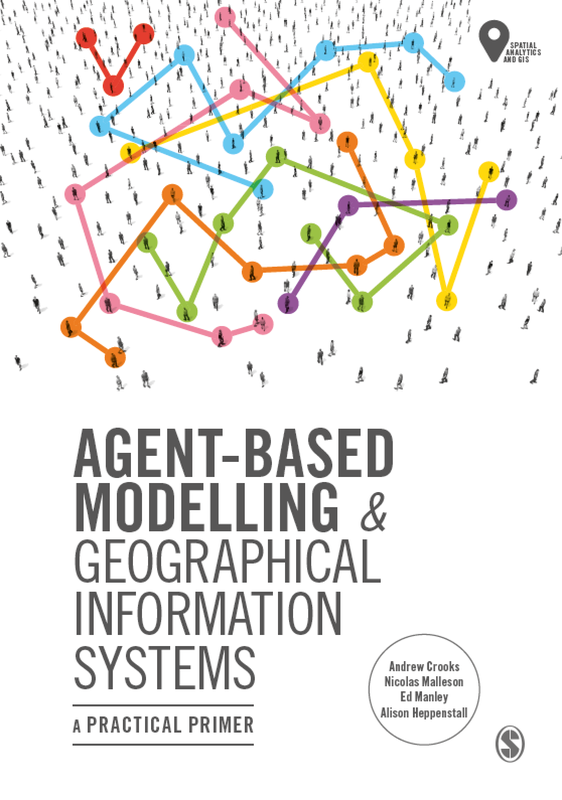 In the book we use sample code and data (all of which can be found on the accompanying website https://www.abmgis.org/) we provide the reader with many of the basic building blocks for constructing agent-based models linked to geographical information systems. Throughout the book we use the software package NetLogo, as it provides an easy route to learn and build agent-based models (although in the appendix we provide links to other models created in other platforms). 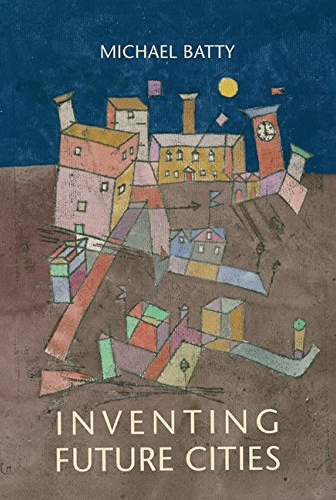 Below you can read some endorsements about the book, see the book outline (along with links to the supporting material or just visit https://www.abmgis.org/). We hope you enjoy it. 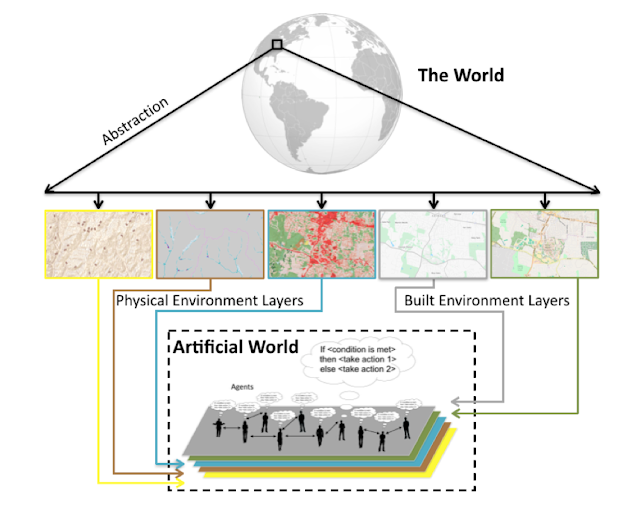 The overarching aim of this chapter is to give the reader a contextual background and general overview of the major developments in geographical modelling for the simulation of the individual. The reader is introduced to a discussion around the purpose of modelling as well how complexity theory has influenced the way that we view (and simulate) geographical systems. We end the chapter by discussing the benefits of bringing together agent-based modelling and GIS. This chapter we introduce the key concepts behind agent-based modelling. What is an agent, and what are rules? These are discussed along with a consideration of the main advantages and disadvantages for simulating spatial systems. A range of established applications are presented to give a flavor of how agent-based models can be successfully applied. The overarching aim of this chapter is to give the reader an understanding of what an agent-based model is. This knowledge will be built upon in subsequent chapters. This chapter presents the main concepts and terminology that students are required to understand geographical information systems. The main data types are presented, along with a discussion of relevant issues such as accuracy and precision. A brief overview of the development of GIS is given along with a flavor of the main software available. Using QGIS, we demonstrate how to prepare and manipulate some example GIS data. Where appropriate, we highlight the main issues that need to be considered when using a GIS and agent-based modelling. This chapter explores the most common approaches by which researchers incorporate human behavior into agent-based models. We explain why it can be necessary to model human behavior and the main considerations that the researcher needs to be aware of when developing an agent-based model. From this, we present an overview of the two main broad approaches, mathematical and conceptual cognitive models when it comes to modelling human behavior in agent-based models. We supplement this discussion with two case-studies that provide examples of how these approaches can be implemented, both examples have the model code available that can be downloaded and experimented with. The chapter finishes with a discussion of some of the thorny issues that researchers need to be aware of when attempting to simulate behavior within agent-based models. Agent-based modelling is one of the most popular approaches used in social and spatial simulation. However, there are several other alternative approaches that are available to the researcher including Cellular Automata (CA), Microsimulation, Discreet Event Simulation (DES), System Dynamics (SD) and Spatial Interaction models. This chapter presents an overview of these other approaches giving simple examples on how they can be used and summarizing the main differences between them. To compare these models, they are applied to the same issue, the spread of a disease using a Susceptible-Infected-Recovered (SIR) epidemic model. This shows that while the same general patterns emerge, the reasons for this are very different. 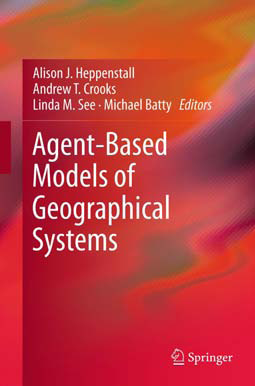 While the entirety of this book gives readers a selection of models (mainly in NetLogo) with respect to agent-based modelling more generally and linking such models to real world geographical information. We thought it would be useful for readers to have exposure to agent-based models developed not only with NetLogo but also other toolkits. In this appendix we provide a gallery of applications from a broad section of fields that have been published in the literature or act as exemplars for getting started with agent-based modelling. The criteria for inclusion here is that the source code and data of the model is available and it is based on real world geographical information. In each case we provide a screen shot of the graphical user interface of the model, a short description of the model, its full citation where possible and where the model (and data) can be downloaded from. 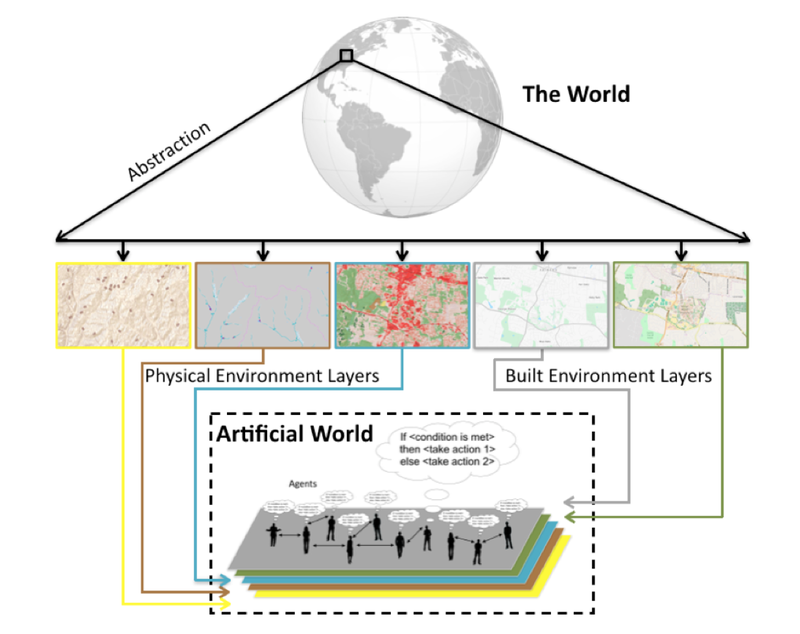 Our hope is that the models provide readers with exposure to the possibilities of agent-based models and its potential for analyzing a wide array of geographical systems and also share their own models and data.